Polot - Lotnisko Świdnik-Lublin Airport. 2019r. Together with the construction of the WSK PZL Świdnik factory and its subsequent development, the City of Świdnik was established. For the builders and later employees of the factory brick residential barracks were built. The first of them was built near the railway tracks and at Franciszkanów. New people who wanted to work here were coming to Świdnik. These people should have a place in working class hotels and the opportunity to buy basic food and business products. Therefore, in 1952, the Provincial Enterprise of Municipal Retail in Lublin, established a branch in Świdnik. The Communists feared that this area of life would dominate private trade, and that they wanted to avoid it. The first points of sale were placed in barracks and free-standing kiosks. The number of state-owned stores (stores) has quickly grown to a dozen or so. In the shops you could buy basic food products, cleaning products, tobacco products, and above all, the communist press. However, the main place where the residents were supplying basic items was (and is still) a market near the railway tracks. In addition, a large employee canteen was opened for the workers. The authorities provided an additional supply of exclusive food: oranges, lemons, chocolate, coffee, cocoa. In addition to the distributor, additional supply was provided to Świdnik for household stores: refrigerators, radios, meat grinders, coffee grinders, tableware, and even bicycles. From the very beginning of Świdnik's existence, cultural life was strictly controlled by the communist authorities. Often, a moving cinema with propaganda films came from Lublin. A little later, feature films appeared that, due to the lack of other entertainment, attracted many residents. At the initiative of the factory management, a workers' club was created, a factory library and a public library (generally available, 1955). The Company's House of Culture and Club "Iskra" was opened. The name "Iskra" came from the title of the first newspaper issued by the Soviet dictator Włodzimierz Lenin. In 1953, the first permanent cinema "Przodownik" was opened, which after many years changed its name to "Lot". In 1966, the first real cinema on the street was put into use in a modern building Work Leaders (main street Świdnik), which currently is called Aleja Lotników Polskich. At the same time, a housing estate for employees was built with the factory. They were located on the south side of the railway line. The first blocks of flats were built in 1951. They were placed between Świerczewskiego and Sławiński streets (now General Leopold Okulicki and Niepodległości). These blocks are three-storey. The first families moved into new apartments when the blocks were still ungraded, there were no paved streets and sidewalks. This housing estate is reminiscent of dozens of other settlements (including military ones) built all over Poland in the 1950s. In 1954, the town of Świdnik already numbered 7,000 inhabitants. The authorities in Warsaw decided to give it city rights. This allowed the creation of the City National Council and the Municipal Committee of the PZPR. The expansion of the city of Świdnik was carried out following the Soviet model. In many aspects, Świdnik reminded Nowa Huta. The City Center was a square that now is called the "Constitution of May 3," with government and party administration buildings built on it. New kindergartens and schools were built in the city. Along with the activities of WSK PZL in Świdnik, there was a need to educate highly qualified employees. In connection with this, on September 1, 1959, the Basic Vocational School (ZSZ) was opened. In 1969, ZSZ students moved to a new school building, with an extensive gymnasium and a large sports field. On October 8, 1970, the Youth Mechanical Technical School was established, followed by the Mechanical Technical School and Mechanical Technical College for Workers. In May 1971, the Technical School named after Zygmunt Puławski. Today (2012) the school functions as a Poviat Center for Vocational Education. In 1960, the city's population reached 11,000 people. In 1960, the first self-service bar "Kosmos" opened in the city that could handle 1 500 people a day. The name "Kosmos" was later an occasion for many jokes about this bar. The 1960s are still the dynamic development of Świdnik. New housing estates were built: Racławickie, Kościuszki, and Kopernika. Despite this, the apartments were lacking. That is why many residents undertook to build their own detached houses. Mainly on Adampol, west of the city center. In the 60's, a new railway station was commissioned, although it is basically a railway stop. There was a railway station in Świdnik, which was established in 1905. The station building is the oldest public utility building in Świdnik. The station could be called Adampol. However, this station is a little west of the city center. That's why the new train station is being moved about 800 m to the east. Railway line Lublin - Świdnik - Chełm received the second track around 1950. The electrification of the Lublin - Świdnik section was completed in 1980. In the 60’s, a heat and power plant was built in Świdnik. In 1969, a sports hall and an indoor swimming pool were put into use. In 1970, the population of Świdnik amounted to 20,000. In 1972, the city was connected to the natural gas network. The biggest event in Świdnik, in 1973, was the commissioning of an underpass under railway tracks, which increased the safety of residents. Świdnik, as a communist city, was to be secular. Nevertheless, the population continued with the faith of their fathers, being mostly Catholics. The faithful used the temple in nearby Mełgiewie or went to churches in Lublin. In the 60's (after expulsion of religious education from schools), the teaching of catechesis was conducted in the rooms of private houses. In 1975, the communists issued the first permit to build a Roman Catholic temple. The square under the church dedicated to the Blessed Virgin Mary Mother of the Church was consecrated in June 1977 (street Cardinal Stefan Wyszyński 32). Incidentally, the church was located far to the north of the city center and even further away from the factory. Other temples were still created with great difficulties. The second temple dedicated to Christ the Redeemer - ul. Kosynierów 6, was erected only in 1988, although the building permit was issued in 1982. The third temple dedicated to Saint Józefa - ul. Partyzantów 64, was erected in 1990. The fourth temple dedicated to Saint Kingi - street Klonowa 16. In 2005, the construction of the chapel began for this church. It is well known that 1980 is the year of the foundation of the Solidarity Trade Union. However, few people remember that "Polish August" began in July 1980 in Świdnik. It is in this city that Polish transformations have begun. Residents of Świdnik were the first to inscribe themselves in the latest history of Poland. On 8 July 1980, at the factory, a strike began at the W-340 department. Factory workers in Świdnik were the first to demand the improvement of existence and freedom and democracy. The igniter of the strike at WSK PZL Świdnik were new prices in the company's buffet. The protest in Świdnik triggered strikes in other factories of the region. The Independent Self-Governing Trade Union "Solidarity" was established, the founding committees of the Trade Unions were established at WSK PZL and the remaining factories of the region The strike at WSK Świdnik ended with the signing of an agreement striking with the communist authorities, a precedent in the history of communist Poland and paving the way for similar solutions to others protests. The communists, who were preparing for the imposition of martial law in Poland, began by interning Solidarity activists on the night of 12 to 13 December 1981. From 13 to 16 December 1981, the Regional Strike Committee functioned in the factory. On December 16, 1981, at 1:00 am, tanks pierced the wall surrounding the area of WSK PZL. Millitary units (ZOMO) entered the factory area and attacked the workers with torpedoes with tear gas. During the attack, the ZOMO officers used the weapon, giving warning shots with the use of live ammunition. Workers, afraid of the massacre, left the factory. When leaving the workers, ZOMO arrested about 40 people who were previously selected. Of those arrested, 22 people were interned. Also arrested was the then general director of the factory, Jan Czogała, who was deprived of his position and also interned. In the following days, women (wives and mothers arrested) gathered in front of the Municipal Office. The authorities dispersed these assemblies with water cannons, smoke candles and gas firecrackers. The inhabitants of Świdnik remained steadfast. The Underground Works Commission "Solidarity" has begun its activity. Radio "Solidarity" broadcasts in the radio and television band. On the walls of houses, on the streets, there were signs indicating the further existence of Solidarity. The priests, with the chaplain of "Solidarity", Father Jan Hryniewicz at the forefront, were a great support in this difficult situation. At that time, the so-called "Świdnickie walks", or mass exodus of residents from homes, at the time of broadcasting the main regime edition of the TV journal, which began at 19; 30. All of Poland looked with admiration at the inhabitants of Świdnik. These walks were a sensation on the scale of Poland. In 1985, the city of Świdnik had a population of 37,000. Socio-economic changes in 1989, began a wave of group layoffs in the factory. The District Labor Office registered 1 127 unemployed. In June 1990, the kitchen was named „Saint Brother Albert” began issuing free meals for the poorest. In Poland, no de-communization was carried out and settlement with the communist period. Former communists have transformed mainly into businessmen. Privatization started at the factory. In the summer of 1990, the first 10 stores were privatized. The first private bus route to Lublin was launched. In December 1990, there were over 3,000 unemployed people in Świdnik. In the summer of 1991, the number of unemployed registered by the District Labor Office in Świdnik increased to 4 500 people. The scale of unemployment in Świdnik was the largest in Poland. There was a lot of poverty in Swidnik. Many young people have emigrated. The city was rising from the great crisis for a long time. It was only after several years that new companies started to be built in some of the WSK PZL facilities. The situation began to improve. But Świdnik lost its air character. In 2008, Świdnik had an area of 20.35 km2 (2 035 hectares). There were 40,555 inhabitants in the city (21,031 women, 19,520 men). The airport of the PZL WSK Świdnik factory. 1951. The airport of the WSK PZL Świdnik factory was founded in 1951. In fact, it was the reactivation of the airport established before the Second World War. The airport served as a factory airport for the factory. The airport served and still serves the purpose of conducting production activities and testing new types of aviation equipment. Occupational tests, flight tests and training of future helicopter users take place there. In 1953, at the area of the Świdnik Airport, the „Aeroklub Workers" in Świdnik was established. Currently, the owner of the airport is the factory and the "Aeroklub Lubelski". The airport is adapted to the currently produced multi-purpose helicopters: PZL W-3 Sokół, PZL SW-4 Puszczyk, AW 149. There are flights and take-off flights after major overhauls of helicopters, including Mi-2 and PZL Kania helicopters. The airport handles a relatively large number of flight operations - 12 takeoffs and landings per day. Up to 22 operations per day. 20 during the day and 2 during the night. The area of the ups with the shape is close to the square, with sides 1000 m x 1 000 m. Two ground runways have been marked out on it. They are used primarily by airplanes and gliders belonging to the aeroclub. There are ten hardened helicopter stations in the field of elevators, in front of the WSK factory hangars. The airport has three hangars. One small aeroclub and two large ones, which are approximately 100 m x 50 m in the base. The airport also has a flight control tower. The Lublin Airport is a place of economical and hard-working people of Eastern Poland, which was once Central Poland. Subsequent governments in Poland were not interested in supporting initiatives of the inhabitants of the Lublin region. An example is the deletion of a road investment - construction of a motorway connecting Warsaw with Lublin and further south-east. Flood investment financing has also been withdrawn. That is why we admire the community of the Lublin region that in such unfavorable conditions, led to the creation of a civil-commercial airport. The previous civil-commercial airport in Poland was opened in 1974 - Rebiechowo Airport for the Tri-City. The Lublin Airport located in Świdnik was opened in 2012. Lublin Airport won the first place in the competition for "The Favorite of Poland", in the years 2000-2012, in the "Life in Architecture" plebiscite. Such an ambitious plan as building a new airport required patience and time. It took years. Decision makers in Warsaw did not facilitate the task. In 2007, in Warsaw, it was said - "You have nothing to try. You will not get any funding. And yet, a central airport for Poland is to be built, so your actions are unnecessary." 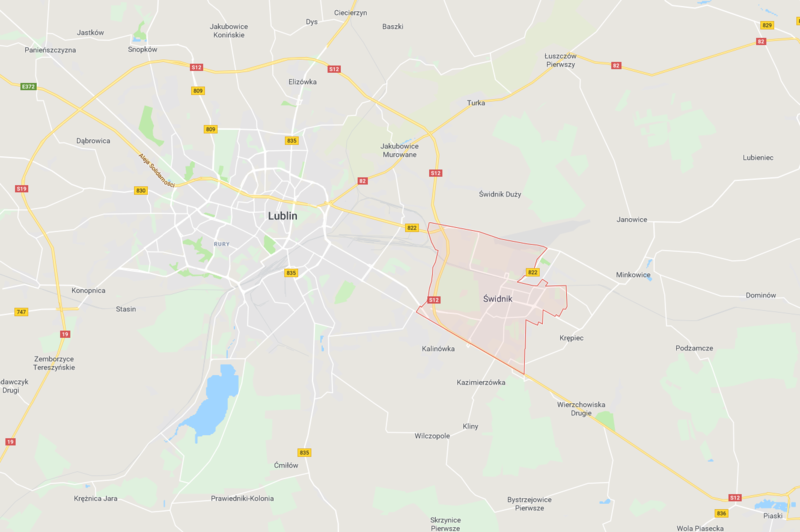 It is worth mentioning here the proposal for the construction of the Airport for Lublin in Niedźwiadzie near Lubartów, (from Lublin a few kilometers behind Lubartów). A few words of subjective commentary; Behind this location, a larger area and opportunities for expansion in the future spoke. The rest are just cons. The distance to Lublin is over 35 km. Location away from the main national roads. A nearby railway line rarely visited and intended for liquidation. It was a proposal to destroy the bottom-up initiative, the construction of the Lublin Airport. After many years of efforts to build the airport for Lublin in Świdnik, on December 21, 2007, the President of the Civil Aviation Authority of the Republic of Poland Grzegorz Kruszyński, signed the promise of permission to establish a communication airport. In March 2008, the company Port Lotniczy Lublin SA bought the first real estate for the construction of a regional civil airport, in the municipality of Wólka. In May 2008, a competition for the architectural and urban concept of the airport was announced. On 4 June 2008, the European Commission agreed to allocate PLN 296.6 million, from public funds, for the construction of the Lublin-Świdnik airport. In addition to EU funds for regional development, the funds from local government funds were transferred to the Lublin-Świdnik airport. The airport's own contribution accounted for 24% of the total investment costs. The Polish state allocated funds from the budget; in 2009 - 12 million zlotys, in 2010 - 15 million zlotys, in 2011 - 10 million zlotys. According to the British company ASM, the purpose of the airport, which prepared the forecast of air traffic for Świdnik, was as follows; 0.5 million passengers in the first year, around 1 million passengers in 2016 and 2.4 million passengers in 2035. At the beginning of its existence, about 200 people would find work in the port. That is why the Lublin Board of Education opened new directions related to air traffic management in vocational schools. One of the classes in I High School named Władysław Broniewski in Świdnik, joined the program, preparing young people for the job of a flight attendant. Ecological problems. - Similarly to the case of the Modlin Airport, and in the case of the Świdnik Airport, "nature defenders" entered the action. Those who know best what threatens nature. Those who treat bowties better, frogs than their own wives and mothers. (We do not know till today: Who is financing this circus?). Environmentalists have stated that the existing airport (from 1939) threatens susions with pearls. They calculated that on the area of 100 hectares of the grassy field of elevation, several thousand of these individuals live. More than cow dung during the grazing period. Fortunately, local authorities have agreed with ecologists. A faculty institution was established, the Foundation for the Protection of the Pearl of the Asphalt, which monitors the state of the grazing colony. In addition, a fence was placed so that cats and dogs from nearby houses would not be in danger. Airport design - As a result of the competition, conducted in 2008, it was decided that Lublin-Świdnik airport will be built according to the project of the Polish-Spanish consortium Sener-ARE-Polconsult. SENER Ingeniería y Sistemas, S.A. is a company operating in the field of engineering and construction for over 50 years. Innovation, the highest quality and independence are their most important corporate values. Founded in Spain, the company is currently a reference point on an international scale in the following areas: Civil engineering, architecture, aerospace and aerospace engineering, aeronautics and vehicles, commissioning and control systems, energy and processes, ship technology. The company employs 2,500 specialists and has 14 offices. ARE is a company from Poland. The company designs housing, public utilities, interiors and industrial architecture. Employs 12 architects (designers and assistants). The ARE company cooperates with designers of many industries in several renowned design companies in Warsaw. The main designers of the company were architects: Jakub Wacławek and Grzegorz Stiasny. ARE developed the architectural side of the project. Documentation for the airport was created on 14 Autocad, Architectural Desktop and 4 Archicad positions. Polconsult is a company that has participated in the design of every extended airport in Poland. In Świdnik, it designed the airport apron and runway. In 2009, the Spanish company SENER took care of the preparation of accurate documentation, according to which the terminal was built. The Spanish earned 11 million 610 thousand zlotys for the project. However, an additional amount, PLN 1 million, 290 thousand zlotys was allocated for author's supervision. On August 25, 2008, the competition court announced its decision regarding the design of the airport. The court appreciated the project for the efficient connection of potential passengers by means of a railroad with port buildings. According to the project, the large white hall of the airport with skylights in the roof was supposed to resemble an electronic alarm clock. Inside the terminal there were to be nine check-in desks for economy class, three for business and a separate VIP zone. You can increase the number of check-in points at any time. In the arrivals hall there will be three conveyors (carousels) for dispatching luggage. The departure hall will be divided into a movable glass wall that will separate the citizens of the Schengen area from the rest of the passengers. It was planned that the whole hall would be 160 m long. A mezzanine was to be built on the first floor with a cafe and restaurant - the place would be a lookout point at the airport and the main hall. In the basement will be built warehouses, technical rooms and equipment that handle the issue and transport of luggage. In 2011, it was finally decided to reduce the airport terminal from 24,000 sq m to 11,000 sq m. That is 55%. The reduction in the size of the building was caused by the withdrawal of LOT Polish Airlines and Euro LOT from possible air operations in the coming years (?). Probably, the authorities in Warsaw were counting on the collapse of the enterprise. It must be remembered that every new commercial airport receives passengers from the Okęcie Airport. The airport's investment covered an area of 300 hectares. You have to remember that the airport itself is not everything. You have to provide passengers with access to it. The new railway line for a bus to the terminal itself is one. The other is a system of access roads. Four roundabouts, flyovers over railroad tracks and viaducts over Lotników Polskich Street in Świdnik were built around the airport. Żwirki i Wigury street is four-strip. There is easy access to the S-17 Warsaw - Hrebenne expressway from each street. The investment took part of the village of Świdnik Duży near Mełgiweska street. A dozen or so properties have been bought. The western part of the high-altitude field was created here. In turn, in the eastern part of the take-off field it was necessary to cut down the stand. In November 2008, demolition began. The work was completed in March 2009. In their place there was a runway (RWY). In order to create a runway (RWY), it was necessary to demolish 15 houses and cut the forest on an area of over 100 hectares. Military graves in the war cemetery had to be moved from the area of the future airport. Soldiers killed during the First and Second World Wars, and Polish soldiers killed in the 1939 Defense War. The bodies (remains) of Polish soldiers, Austrians and Muscovites were laid on the municipal cemetery in Świdnik. On February 13, 2009, the Marshal's Office in Lublin received a minister's decision authorizing the removal of 142 hectares of forest, the so-called "Hospital Forest" around the future airport. Lublin Airport company would have to pay about 100 million zlotys for this, but only after deforestation procedures have been completed. However, through the provisions of the special law, there was no need to pay for cutting down the forest. From the land thus obtained, 118 hectares are intended for the runway and airport infrastructure buildings, while on 23 hectares, access roads have been created. On March 20, 2009, the Lublin City Hall brought to Lublin Airport, another 125 ha of land located in Świdnik. The value of the land was 33 million zlotys, which means that the city covered over 70 percent of the shares in the investment. The land, the local government of Lublin, has been repurchased, in previous years, from Pekao and private owners. 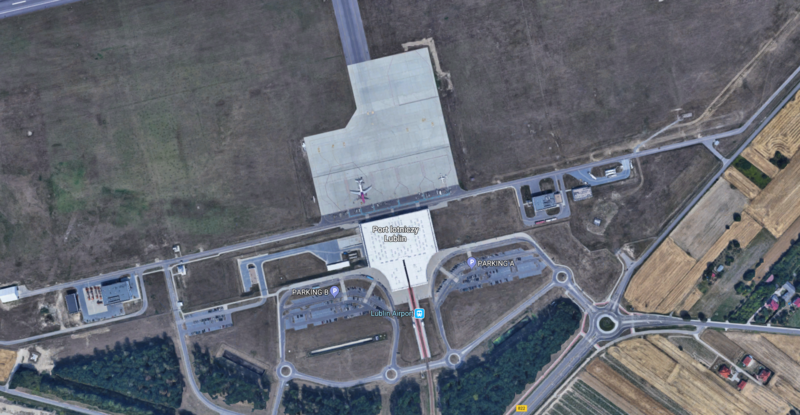 On 18 October 2010, the province governor of Lublin, Genowefa Tokarska, signed the permit for the construction of the Airport, which would be immediately enforceable, while confirming that the investment will be completed in spring 2012. This document officially confirmed the construction project, divided the property, allowed for full felling of the forest and enabled the physical start of the construction of the airport. Krzysztof Grabczuk, thevoivodship marshal, also confirmed the earlier resolution of the first four tenders for construction with contractors. The environmental decision allowed the start of construction works in October 2010. On November 10, 2010, construction started, which in two years led to launch on December 17, 2012, the first regular flights from Lublin to several cities in Europe. In the first days of construction, bulldozers leveled the terrain, the so-called "motorcycle hills". At the same time, tree felling and leveling were carried out. The construction works were carried out efficiently, therefore, already in October 2011, the platform board (aircraft parking) was completed. In 2012, the terminal was built by Budimex in nine months (construction start October 2011). The cost of the terminal is 67 million zlotys. As part of this work, the building of the airport fire brigade and a technical building were also built. The total construction cost was calculated at 400 million zlotys. On 1 December 2012, an open day was held at the airport. The airport was visited by around 20,000 people. The official opening of the Airport took place on December 17, 2012. The opening ceremony was attended only by Minister of Transport, Construction and Maritime Economy Sławomir Nowak. Where were the highest Polish authorities? Let's skip this question. 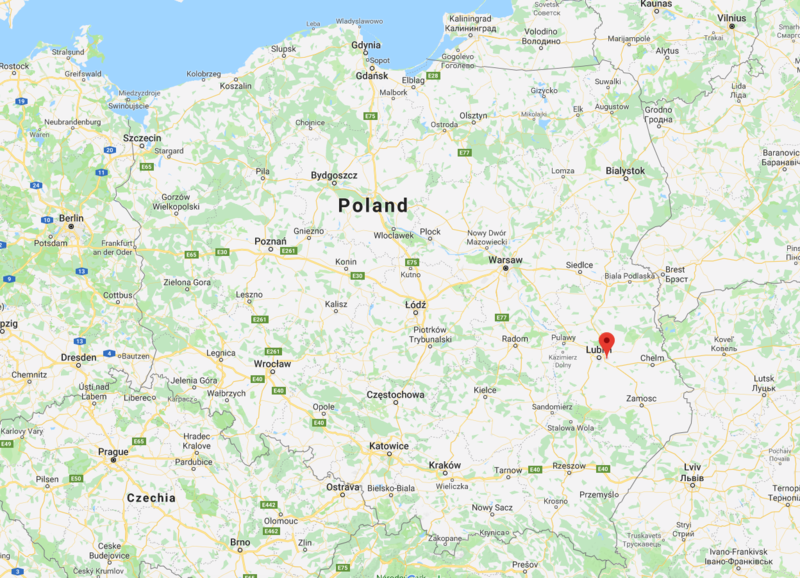 However, from the Lubelskie region, there was no one missing. The ceremony was attended by representatives of local authorities, police and representatives of the Roman Catholic Church. The first plane with passengers landed on December 17, 2012. (Monday), at 09; 00. It was a charter cruise with guests invited by the Lublin Airport authorities. On December 17, 2012, at 13:25, the first cruise plane with passengers landed. It was Boeing B 737-800 from Ryanair, an Irish airline. The plane flew from Stansted Airport near London. This plane with new passengers flew to the UK at 14; 05. On this day, Ryanair launched two connections from Lublin; to London and Dublin. Wizz Air, a low-cost airline operating in Central and Eastern Europe, from 18 December 2012 (Tuesday) began flights from Lublin Airport to London (Luton) and Oslo (Sandefjord Torp). The first flight of Wizz Air, from London Luton to Lublin (flight number W6 2066, plane A 320), landed at 12; 05 and took off on the next route. The second flight, on the same day, to Oslo Sandefjord Torp took place in the afternoon. On the first day of operation at the Lublin airport, Wizz Air carried over 550 passengers. The first plane in general, which landed at the airport, was an An-26 transport aircraft, an aviation company EXIN Sp. z o.o. from Lublin. Already in the first week, the airport served 4,000 passengers, which was a great result. The result is even better when we look at the number of people employed in the port. The use of seats in airplanes reached 90%. From March 2013, a connection to Liverpool, the Ryanair line, has started. In addition, in February 2013, the first charter flights to Egypt took place. In 2013, the airport served about 400,000 passengers. IATA code: LUZ, ICAO code: EPLB. It is located on the south-eastern grass side, near the factory Świdnik Airport, operated by the PZL Świdnik plant and the aeroclub. 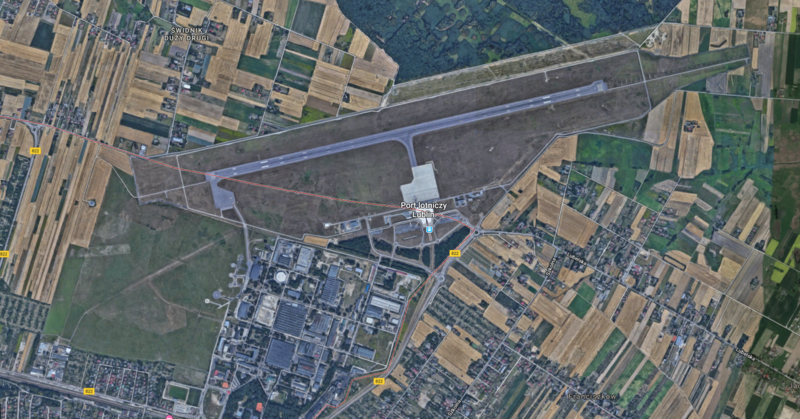 From December 13, 2012, Lublin Airport is visible on the Flightradar24 website. Airport area around 250 hectares. The joint-stock company Lublin Airport was formed in 2010 by four shareholders. The companies include municipalities of Lublin (60.1955% of shares) and Świdnik (5.5440%), Lubelskie Voivodeship (34.2513%) and city Świdnik (0.0093%). The airport was created from scratch. A modern runway was built along with accompanying infrastructure. The platform board has 4 stations for class B 737 and A 320 airplanes. At the airport there is a hazard elimination station, a terminal for passenger service, road infrastructure with parking lots, a fire brigade building, a technical building and an aviation fuel station. In order to allow airport customers efficient access, a new street Jana III Sobieskiego was built, connected to the existing road infrastructure. Other streets were also modernized and rebuilt. The course of Mełgiewska Street has been changed. For the needs of the airport, a new electrified railway line no. 581, from Świdnik Miasto to the terminal itself. According to the plan, the route is to be served by EN57AL electric traction units belonging to the Lublin province. It takes 15 minutes by rail from the center of Lublin to the airport. The Lublin-Świdnik airport is the 13th largest airport in Poland. Annually, it can be used by up to 1.1 million passengers. The new terminal has 11,000 square meters, and the RWY has 2 520 m x 60 m. At the same time, 4 medium-sized passenger planes can be cleared. central lights on the runway. Taxiways and fast exit routes. Control tower. Completion of road construction within the Airport. Completing the navigation systems.